The P-40 earned undying fame as the Flying Tiger of World War II when flown by General Claire Chennaults Volunteer Group fighting the Japanese in China and Burma. It also saw much service in the Middle East where it was used by Britains R.A.F. and nicknamed the Tomahawk and Kittyhawk. When World War II broke out, the P-40 was the only fighter available in quantity to the U.S.A.A.F., it being the first American single seat plane to be manufactured in the U.S. on a mass production basis. By the end of the war, over 14,000 planes had been delivered to fighting theatres. Guillow was founded in 1926 by a World War 1 US Navy aviator and is the world's largest manufacturer of balsa wood model airplane kits. They have an enviable reputation for producing quality kits with excellent building instructions and plans. 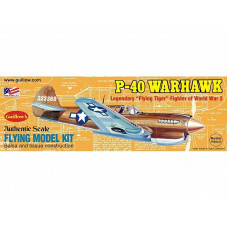 The 500 series (16½" wing span) of WW2 models is their most popular range and is suitable for ages 10 years and upwards. These easy building balsa airplane kits contain laser cut balsa parts, plastic cowls and canopies, decals, plastic prop, wheels, tissue and a 24-page model building booklet. Models are approximately 1:30 scale. Each kit is supplied with a rubber band motor for powered flight but can also be adapted for gas powered control line flying with a .020 engine (not included). 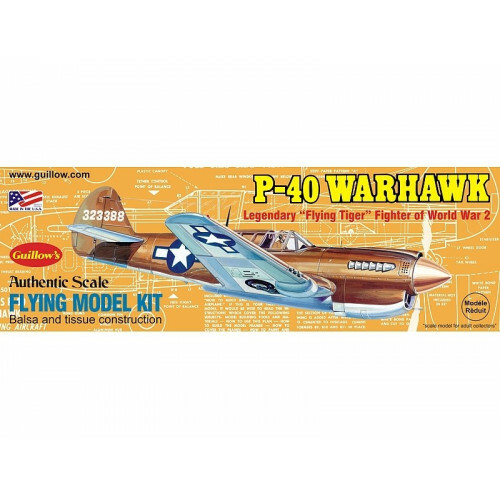 These model construction kits have scale realism for the super detail fan and light weight for those who build and fly. Each model is a small but faithful replica of a well known airplane. A great kit representing excellent value for money and hours of fun!